In the tumultuous business of cutting-in and attending to a whale, there is much running backwards and forwards among the crew. Now hands are wanted here, and then again hands are wanted there. There is no staying in any one place; for at one and the same time everything has to be done everywhere. It is much the same with him who endeavors the description of the scene. We must now retrace our way a little. It was mentioned that upon first breaking ground in the whale's back, the blubber-hook was inserted into the original hole there cut by the spades of the mates. But how did so clumsy and weighty a mass as that same hook get fixed in that hole? It was inserted there by my particular friend Queequeg, whose duty it was, as harpooneer, to descend upon the monster's back for the special purpose referred to. But in very many cases, circumstances require that the harpooneer shall remain on the whale till the whole tensing or stripping operation is concluded. The whale, be it observed, lies almost entirely submerged, excepting the immediate parts operated upon. So down there, some ten feet below the level of the deck, the poor harpooneer flounders about, half on the whale and half in the water, as the vast mass revolves like a tread-mill beneath him. On the occasion in question, Queequeg figured in the Highland costume- a shirt and socks- in which to my eyes, at least, he appeared to uncommon advantage; and no one had a better chance to observe him, as will presently be seen. It was a humorously perilous business for both of us. For, before we proceed further, it must be said that the monkey-rope was fast at both ends; fast to Queequeg's broad canvas belt, and fast to my narrow leather one. So that for better or for worse, we two, for the time, were wedded; and should poor Queequeg sink to rise no more, then both usage and honor demanded, that instead of cutting the cord, it should drag me down in his wake. So, then, an elongated Siamese ligature united us. Queequeg was my own inseparable twin brother; nor could I any way get rid of the dangerous liabilities which the hempen bond entailed. *The monkey-rope is found in all whalers; but it was only in the Pequod that the monkey and his holder were ever tied together. This improvement upon the original usage was introduced by no less a man than Stubb, in order to afford to the imperilled harpooneer the strongest possible guarantee for the faithfulness and vigilance of his monkey-rope holder. I have hinted that I would often jerk poor Queequeg from between the whale and the ship- where he would occasionally fall, from the incessant rolling and swaying of both. But this was not the only jamming jeopardy he was exposed to. Unappalled by the massacre made upon them during the night, the sharks now freshly and more keenly allured by the before pent blood which began to flow from the carcass- the rabid creatures swarmed round it like bees in a beehive. Nevertheless, it may well be believed that since they have such a ravenous finger in the pie, it is deemed but wise to look sharp to them. Accordingly, besides the monkey-rope, with which I now and then jerked the poor fellow from too close a vicinity to the maw of what seemed a peculiarly ferocious shark- he was provided with still another protection. Suspended over the side in one of the stages, Tashtego and Daggoo continually flourished over his head a couple of keen whale-spades, wherewith they slaughtered as many sharks as they could reach. This procedure of theirs, to be sure, was very disinterested and benevolent of them. 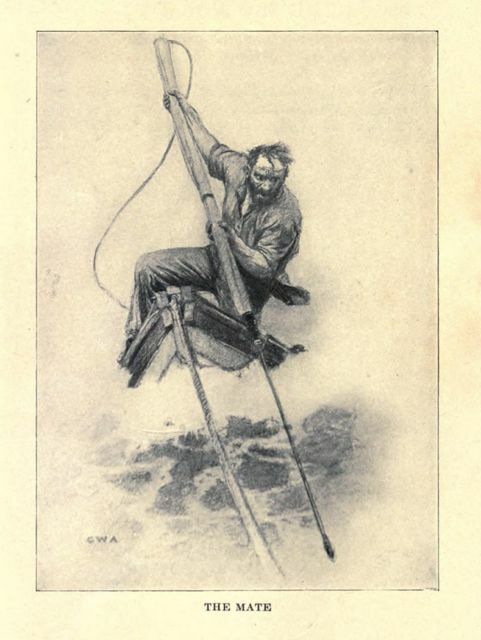 They meant Queequeg's best happiness, I admit; but in their hasty zeal to befriend him, and from the circumstance that both he and the sharks were at times half hidden by the blood-muddled water, those indiscreet spades of theirs would come nearer amputating a leg than a tall. But poor Queequeg, I suppose, straining and gasping there with that great iron hook- poor Queequeg, I suppose, only prayed to his Yojo, and gave up his life into the hands of his gods. Well, well, my dear comrade and twin-brother, thought I, as I drew in and then slacked off the rope to every swell of the sea- what matters it, after all? Are you not the precious image of each and all of us men in this whaling world? That unsounded ocean you gasp in, is Life; those sharks, your foes; those spades, your friends; and what between sharks and spades you are in a sad pickle and peril, poor lad. But courage! there is good cheer in store for you, Queequeg. For now, as with blue lips and blood-shot eyes the exhausted savage at last climbs up the chains and stands all dripping and involuntarily trembling over the side; the steward advances, and with a benevolent, consolatory glance hands him- what? Some hot Cognac? No! hands him, ye gods! hands him a cup of tepid ginger and water! "Ginger? Do I smell ginger?" suspiciously asked Stubb, coming near. "Yes, this must be ginger," peering into the as yet untasted cup. Then standing as if incredulous for a while, he calmly walked towards the astonished steward slowly saying, "Ginger? ginger? and will you have the goodness to tell me, Mr. Dough-Boy, where lies the virtue of ginger? Ginger! is ginger the sort of fuel you use, Dough-boy, to kindle a fire in this shivering cannibal? Ginger!- what the devil is ginger?- sea-coal? firewood?- lucifer matches?- tinder?- gunpowder?- what the devil is ginger, I say, that you offer this cup to our poor Queequeg here." "It was not me," cried Dough-Boy, "it was Aunt Charity that brought the ginger on board; and bade me never give the harpooneers any spirits, but only this ginger-jub- so she called it." "Ginger-jub! you gingerly rascal! take that! and run along with ye to the lockers, and get something better. I hope I do no wrong, Mr. Starbuck. It is the captain's orders- grog for the harpooneer on a whale." "Enough," replied Starbuck, "only don't hit him again, but-"